On a recent trip to the southern border, Rep. Michele Bachmann (R-MN) witnessed coyotes brazenly smuggling illegal aliens across the Rio Grande in broad daylight as border patrol and local police watched on. Bachmann shot video of the entire episode on her iPhone, the footage of which she provided exclusively to Breitbart News. “You see the Jeep pulling up to the water of the Rio Grande on the Mexican side,” Bachmann told Breitbart News. “You see a guy get out of the back of the Jeep, he blows up a 12-man raft and then a very pregnant woman gets inside. It’s in broad daylight–5 o’clock in the afternoon, yesterday afternoon. They get in the raft and start taking off, and there’s an island in the middle of the river in no man’s land and that’s usually the direction they head but in this case, you heard it–they went straight to the U.S. border,” Bachmann said. The video shows men in a raft dropping off a woman on the U.S. side of the river, after which a Border Patrol truck approaches her location. Later, while agents are addressing the first situation, a second boat – powered by individuals using their hands to paddle – crosses the river downstream. 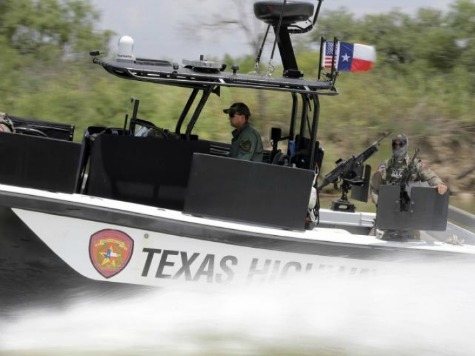 A border patrol agent overheard on the video said he suspected the second boat had narcotics on it and that the first boat and departure of a pregnant woman was a decoy to distract the law enforcement officials from the drug smuggling. When the pregnant woman landed in the U.S., “she said she had ‘credible fear’ which are the–that’s the golden ticket right now for a woman and her child to be able to get out. When I was standing with the border security guard watching all of this go down, he said that behind this raft there were another four and they were running drugs from Mexico into the United States,” Bachmann said. This story and video is just the first part of a lengthy interview with Bachmann on her trip to the border with Rep. Steve King (R-IA) and on what they witnessed while there. Specifically, regarding the role of U.S. law enforcement under President Barack Obama’s policies, Bachmann said the Border Patrol has been reduced to “people processing” rather than protecting the United States. The effect, she added, is that the United States has open border by executive order from President Obama. Bachmann said that President Obama shouldn’t be given any more money by Congress to deal with the border crisis.